Sixteen Red Russet and eighteen Brown Russet potatoes were purchased from a supermarket and prepared for chitting in soil. Experience has indicated that soil chitting makes for a very strong root system prior to planting outdoors about 1 June in my Zone 5. Planting in June inhibits the infestation of the Colorado Potato Beetle, since they have nothing to lay eggs on, when they first emerge from the soil in the Spring. The potato growth is not reduced much since they are growing in the pots. Expectation is four pounds plus of new tubers from each plant for a total weight of 136 pounds, which meets my storage requirements. At maturity my potatoes store for six months in my basement root cellar. The potatoes all rotted sprout inhibitor preventing chitting. They were all discarded. 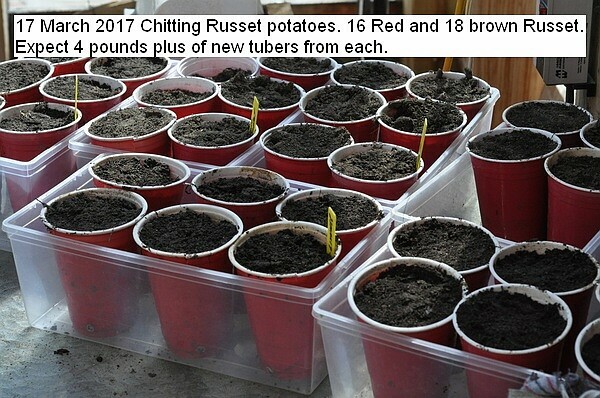 This entry was posted in Uncategorized and tagged 23 March 2017 Chitting Potatoes, Brown Russet Potatoes, Red Russet Potatoes. Bookmark the permalink.